The filament clamping mechanism consists of a spring that pushes an arm with a toothed wheel against the extruder driving wheel. The mechanism has an adjustable range in which it can clamp. The clamping force itself cannot really be adjusted. The clamping wheel is toothed to be able to detect if it is rotating. Sometimes it is necessary to adjust the clamping range. For example, Flex material is rather soft. If the clamping mechanism is adjusted to maximum range, the filament will be squeezed flat, causing unnecessary wear to filament and clamping mechanism (and interfering with the jam detection sensing mechanism). By decreasing the clamping range, the filament will only be squeezed to a certain extent and then no further. 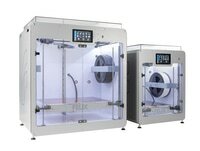 However, if the clamping range is set too small, it is possible that the clamping wheel is not pushing far enough to completely push the filament against the extruder drive wheel. The clamping range can be adjusted by turning the bolt that runs through the clamping spring. 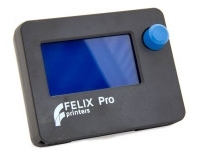 To reach the bolt, you need to home the X axis of the printer. Through the slit in the top cap you can see the bolts of the two extruders. You will need a 3 mm Allen key to turn the bolts. To be able to turn the bolt on the right extruder, you need to select it, so it rotates towards the slit. If you turn the bolt clockwise, the spring is compressed further and the clamping range is decreased. If you turn it counter clockwise, the spring is able to expand more and the clamping range is increased.